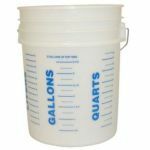 The Bucket Stacker by Bucket Boss is made of durable yellow colored plastic and has a handle to easily lift the tray out of a 5 gallon bucket. The Bucket Stacker nests 4 deep in most 5 gallon buckets. There are 4 compartments to organize and hold small parts.